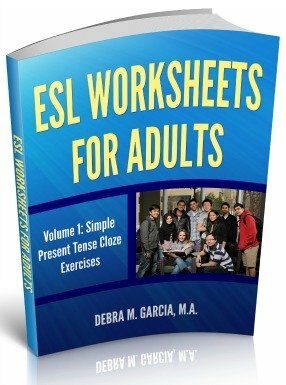 Sign up for my newsletter, ESL Teaching Tips, and get a free copy of my book, ESL Worksheets for Adults, Volume 1: Simple Present Tense Cloze Exercises. The book has 27 Simple Present Tense worksheets for use with English Language Learners. It includes complete answer sheets for all cloze exercises. Each worksheet has at least 20 blanks to fill in. Just enter the info below and you'll receive a confirmation email and instructions on how to download the book for free. BTW I know time is precious. I will only send you stuff I feel is genuinely helpful for your teaching practice and/or running a tutoring business. 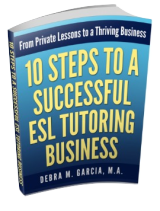 I'll send you ESL Teaching Tips every month or two on average, possibly more often if I have something that can't wait. Please write to me with ideas for what you feel will be helpful to have for use with your students, or with running a tutoring business. You can use my contact form or use Facebook and leave a comment below. I'd also greatly appreciate a "Like" on Facebook!